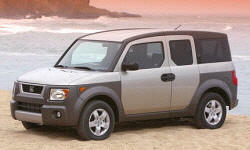 Why the 2005 Honda Element? What I love most about the Element is something I very rarely see mentioned... the cargo capacity, not only in terms of volume, but in shape. With the fuel tank positioned low and under the vehicle, and the ingenious design of the rear suspension, the Element has a completely flat floor from the rear hatch all the way fo the front footwells, just like you would expect from a full-size van. I haven't seen any other passenger vehicle with this kind of interior design, and the usefulness is remarkable for hauling, loading in wide objects, and hauling large dogs. Combine that shape and volume with the seats that quickly fold down into beds, fold up and away to the sides, or remove entirely... it's far more versatile than any crossover or even station wagon interior. It might be thirsty and relatively low on power, but the tradeoff is that the powertrain is low-tech and incredibly reliable. No non-maintenance engine repairs, still on the original clutch at 130k. The interior materials are very tough (though they do stain easily), and the only issue I have is that the hard plastic in the cargo area does scratch easier than I would like, but then again I've been hauling quite a bit back there. Why Not the 2005 Honda Element? It's a large, open box with very little carpeting or sound deadening. Put simply, it's very loud, especially on rough highways. But that is to be expected, considering. This is my only major gripe with the vehicle... I seem to get a consistent 22mpg, whether it is city driving, long flat highways, or mountains. If I go out of my way to drive conservatively, or use a medium-to-heavy foot with the aid conditioner, the difference is completely negligible... it's pretty much always 22mpg. It is a tall box, and handles as such. Somewhat short wheelbase can result in a bit of yaw at speed in ruts or crosswinds. I would never call it "fun to drive", but it gets the job done. New struts all around at 120k gave it a bit more directional stability and less float. The 2.4 provides adequate real-world power for city and suburb use, especially with the 5-speed manual. However, it feels like it is working very hard to gain speed on sustained freeway inclines and mountain passes. The engine turns somewhat higher-than-normal revs at 70+ mph. There is a noticeable drop in power when the AC compressor is running. On the up side, it is a remarkably reliable engine, is the 75,000 miles I've owned this vehicle, it hasn't given any surprises or required any non-maintenance repairs. I expect an easy 200,000 out of the powertrain, possibly more. The ingenious design that allows a completely flat floor from the rear hatch all the way to the front footwells unfortunately means that the fuel tank sits below the vehicle, and the rear suspension does not have as much travel as one might expect in an aggressive-looking vehicle. The fuel tank has a metal bar surrounding it preventing scrapes from rocks, but it sits low, so the ground clearance isn't quite as high as the chunky tires and styling might suggest. The Element does fine on typical forest service fire roads, rutted dirt and gravel trails, and similar situations. Just be aware not to high-center it on doubletrack with a high center ridge. The AWD system leaves a lot to be desired if you're coming from manual-transmission Subaru or Audi Quattro mechanical systems. The Element is essentially a FWD car until the front slips, resulting in an unexpected "pushing" sensation when the rear axle digs in. I like knowing the AWD is there, but it isn't as confidence-inspiring as a true 4WD or lockable AWD setup. A remarkably versatile, and dependable transportation appliance. Often misunderstood because Honda didn't quite know how to market it correctly, but if you're looking for something that sits somewhere between a crossover and a van, and you don't mind the relatively van-like ride gas mileage, it is a very unique, useful, and dependable way to haul just about anything you could imagine, to anywhere you could imagine.